The Wireless electricity transmission system pioneered by Dr Nikola Tesla has the potential to meet our future global energy needs, if only the funding and organizational structures can be put in place as a matter of urgency. 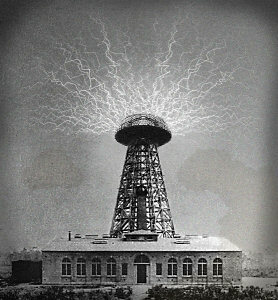 “All that is necessary,” says Dr James Corum, “is that Tesla’s transmitter power and carrier frequency be capable of round-the-world propagation.” In fact, Tesla (in the Los Angeles Times, December 1904) stated: “With my transmitter I actually sent electrical vibrations around the world and received them again, and I then went on to develop my machinery.” Dr Corum notes in an article on Tesla’s ELF (extremely low frequency) oscillator that the tuned circuit of Tesla’s magnifying transmitter was the whole Earth-Ionosphere cavity. Another common criticism of the Tesla wireless power system is regarding its possible biological effects. Calculating the circulating reactive power, the Corums and Spainol find a density of a microvar per cubic metre at 7.8 Hertz, which is quite small, while it is well known that such a frequency is very biologically compatible. The authors also look at the present 100 V/m Earth-ionosphere field and again find that raising it by a factor of 4 to 10 will pose no ill effects (thunderstorms do it all the time around the world). In terms of economic theory, many countries will benefit from this service. Only private, dispersed receiving stations will be needed. Just like television and radio, a single resonant energy receiver is required, which may eventually be built into appliances so that no power cord will be necessary! Just think; monthly electric utility bills from old fashioned, fossil-fuelled, high-loss electrified wire-grid delivery services will be optional, much as cable TV is today. In the 21st century, “Direct TV” is the rage, which is an exact parallel of Tesla’s “Direct Electricity”. Let us fulfill this prophecy of Tesla, making it a “triumphant success” by supporting a philanthropic, international wireless power station installed on a remote island to electrify the whole world. The benefits of immediately making direct electricity available everywhere are too numerous to count. Become educated about Tesla’s wireless energy transmission discovery and the Wardenclyffe Tower’s potential for transforming the world’s generation and delivery of electricity at http://www.integrityresearchinstitute.org .
. Read Harnessing the Wheelwork of Nature: Tesla’s science of Energy by this author for more details about this discovery, and other fascinating aspects of Tesla’s inventions. About the Author: Thomas Valone received his Master’s in Physics from the State University of New York at Buffalo (1984) and his PhD in General Engineering from Kennedy-Western University in 2003. Click here for his CV. Editor’s note: For a long, long time, the people of the world have been living in a fundamentally feudal world. Humans have been bludgeoned into accepting the blind dictates of remote (and usually unseen) authority figures for so long that it almost seems like the normal ‘human condition’. Humanity has been trained to prop up a pyramid-shaped society in which nothing comes for free, and all your time and energy is heavily taxed by and for robber barons and corporate gangsters. Humans have long been told to accommodate themselves to their lot – to work, consume, reproduce and die in an endless rat-wheel of pointless activity – as alternative possibilities of all kinds have been choked off, bought out, ridiculed, hidden and extirpated from view. For far more than a century, oppressive plutocrats have kept us all in a totally unnecessary state of powerless darkness, promulgating profitable wars, pogroms and technologies to spread hate, terror and generalised fear among us all. While we’ve been blinded by tinsel and addicted to the circus entertainments of idiot boxes, they’ve gotten on with the profitable pastimes of finance, war, famine and pestilence - while their programs brainwash us all into thanking them for the advances in easy credit, technological trinkets, genetically ‘improved’ foods and toxic ‘wonder drugs’. It’s important to realize that the motivations of those at the pyramid’s capstone are not the same as those of the average wage slave or mid-level management. The inbred families of faceless dictators don’t make plans on a mortal scale and their names don’t appear on the ‘richest men’ lists; most of their dynasties predate such confections. Their motives are rooted in a dominating will for untrammeled power - and an insecure greed that can never be satisfied. As far as they’re concerned, if you’re not part of their family you’re not part of the same species. They view everyone outside their genetically intertwined circles as vermin living in a maze of crass filthy warrens, fit only for enslavement – and ultimate extinction. Their numbers are few, yet everyone who’s part of their system is responsible for the destruction of the ecosystem, and is robbing their own children of their birthright – and almost everyone is part of their system. A century ago anyone who publicly denigrated rulers, kings and plutocrats called a heap of trouble down on themselves. Times appear to have changed – so lets change them a little more, and create a system that the greedy and pernicious can’t profit from; a system that frees and supports every man, woman and child on the planet. We still have time to create paradise for all on Earth if we seize the day; if we all stop buying their crap, borrowing and using their credit and money and playing their destructive games – if we play and work our way into a truly new millennium of liberty, fraternity, equality and prosperity for all! Free energy is the crux upon which all possibilities can turn. There are many methods to derive more energy from a system that is required to maintain it; see or instance http://nexusilluminati.blogspot.com/search/label/free energy . But this is only one part of a complex series of maneuvers we’re going to have to undertake - which we’re going to find are necessary if our species is to truly thrive, or even survive. Changing the world for the better will take whatever you have to give. If you’ve read this far, you’re the one to do it. You are the change agent, and all real change begins within; time and energy are what you are, and the tools you use to contribute. Look around – great movements are happening right now, at this particular nexus in history. Join in and help turn the wave of change into an unstoppable tide. PS – ALL technological fixes bring new problems that need solving.- but Tesla’s technology is a solvable solution and a pathway to hope and success for us all.